If your dog could talk what questions do you think they would ask you most often? Every dog and dog breed is a little bit different, but some traits seem to be universal for a specific breed like the Labrador Retriever. 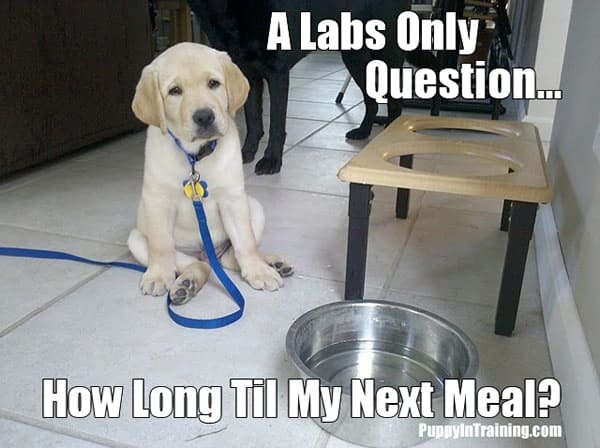 We can think of one question that all Labs would constantly be asking their owners. We’ve raised 3 purebred Labrador Retriever puppies in training and we are currently raising our fourth. We’ve probably also puppy sat 100+ Labs during our time as guide dog puppy raisers. I’d have to say after being around all of those Labs over these past 7 years this statement is probably true 99.9% of the time. What do you guys think? Have you raised Labrador Retrievers? Is this their only question? Or perhaps there’s a little more to my Lab puppies in training: Stetson, Derby, Dublin, and Adelle. 1. How Long Til My Next Meal? 2. Can I have a treat? 3. Where is my tennis ball? 4. When is my next walk? 5. Where’s the nearest lake/pool? I’m speculating a little here as I’ve yet to have a Lab who loves to swim. Although many of my friends Labs as well as Labs I’ve puppy sat were definite water dogs. I’m not too sure about Adelle yet, but she does like sleeping with her head in the water bowl…we’ll see. Second, our puppies in training aren’t allowed to have tennis balls because they can become obsessed (or so they tell us). Once again I’m speculating, but seeing how much my pup’s love their other toys I could very well see them obsessing over a tennis ball. So that’s the list. Do you have a dog or puppy? If they could speak what do you think their top 5 questions would be? Tell us about it in the comment section below. If you enjoyed this puppy meme with Dublin then check out another one we made when he was a little bit older: This Puppy…Is Part Boxer! What a great website, so glad I found it! And I love labs! I have owned a couple labs in my life and this is just spot on. Food, love, and fun are the only things on their mind, ever. I’ve also never seen a dog eat as quickly as a lab could. They’re like living vacuums. In my experience, this also makes them incredibly easy to train. They are already intelligent dogs with the drive to do anything for food. When I first brought home Adelle (yellow Lab) I thought she’d be my first normal eater, but after a few days of slow eating she now rivals my other Labs in the eating competition.